I was privileged to participate at the Schweinfurth Memorial Art Center in a trunk show of quilt artists who are members of the Central/Western New York Region of SAQA. It was the first time I had been part of a trunk show and it was great fun. One of our two regional SAQA reps, Marcia Eygabroat, organized seven of us into what was definitely a diverse and entertaining show. The weather in Auburn, NY, where the Schweinfurth is located, was snowy but there was still a full room in attendance for the show. 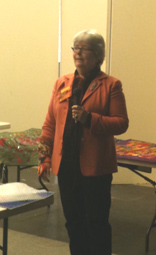 Participants included Mary Diamond, Ruth White, Pamela Kirch, Sally Dutko, Janet Root, Aafke Steenhuis and myself. 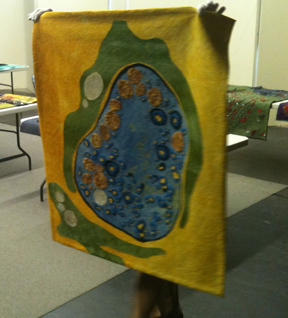 I had previously been in a workshop taught by Mary, participated in a Guild retreat where Janet had been of great help, and seen Aafke present at a Quilt Guild meeting. 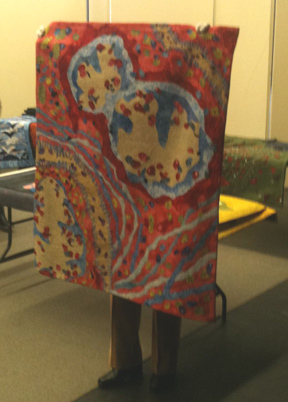 For me, this represented an opportunity to see more of their work, meet some new people, and get to discuss my favorite topic - quilting! We each presented a selection of five or more of our works. Here are some photos from the event. Apologies for the photo quality - I forgot my regular camera and used my iphone. Aafke had, as always, an impressive selection of quilts to share, but maybe what was most fascinating was a brace she was wearing on her right arm. It was necessary as she had reinjured a chronic problematic wrist. You can't see it very clearly in this photo but she had decorated the cast with little quilts, etc. It was very colorful. Ruth White shared some of her amazingly detailed work on small quilts with us. Here is Ruth after her presentation displaying some of her works. 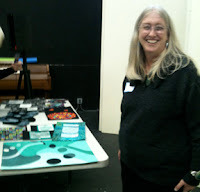 Pamela Kirch shared a number of pieces from her series on microbial cells. Aren't the colors amazing! Mary shared some of her works from her latest series on her grandchildren and Sally shared some of her abstract art pieces. I am sorry I don't have photos of either but you can check out Mary's website for photos of some examples. And, there are some examples of Sally's work on a webpage created for her participation in the Greater Ithaca Art Trail event. Janet Root concluded the Trunk Show with a fashion show of a selection of her many jackets that she creates. 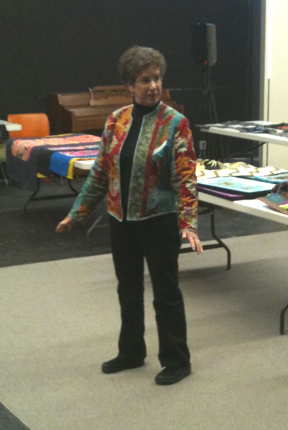 A number of the other presenters and helpers modeled the jackets for Janet as she discussed them. Here is Marcia Eygabroat, our SAQA rep, modeling another of Janet's jackets. All in all, it was a great way to spend a snowy afternoon in upstate New York. I am sorry to miss all the fun. I love those quilters, and I consider us lucky to have all those talents folks just around the corner. Kudos to you for posting this and thanks for giving us a look at the day. 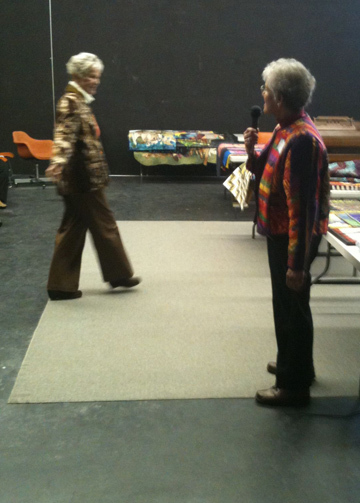 And it was fun to see your two works in the Quilts=Arts=Quilts exhibit again, Pat!